Light bulbs have become standardized in design and construction to ensure that standard sockets installed in new homes will fit a standard bulb, lamps make use of standard bulbs of a provided size, and new lighting fixtures are provided with sockets fitting whatever type of standard bulb the purchaser desires. Ever since Edison's invention of the incandescent lamp, lighting has never been the same. Consequently, people demand more efficient and durable lighting solutions. Halogen and compact fluorescent bulbs have been created for consumer use. Incandescent and halogen bulbs consume a massive amount of energy, produce a large amount of heat and have a relatively short life. They provide only a warm white illumination. Fluorescent bulbs, although more efficient than incandescent bulbs, do not deliver the same warm light as that generated by incandescent bulbs. Furthermore, there are health and environmental challenges concerning the mercury contained in fluorescent bulbs. Solid state lighting (SSL), for example light emitting diode (LED) or organic light emitting diode (OLED) based retrofit lamps, offer superior performance over compact fluorescent lamp (CFL) based retrofit lamps when it comes to efficiency, instant light output, and light quality. Another strong appeal of using LED light sources is that they offer superior lifetime for the reason that the only failure mode is a slow depreciation of the outcoupling optics of the light source. An LED is made up of semiconductor junction, which produces light as a result of a current flowing through the junction. An LED light bulb is a device which includes one or more LEDs and often times a drive circuit for the LEDs, which are both located within a conventionally shaped container (or shell). Light bulb assemblies typically comprise a light bulb mounted to a standard base. For example, the light bulb can be mounted to an Edison screw base that is designed to be threadably connected to a complementary light bulb socket or maybe a bayonet base which is constructed to connect to a complementary light bulb socket with a bayonet style connection. 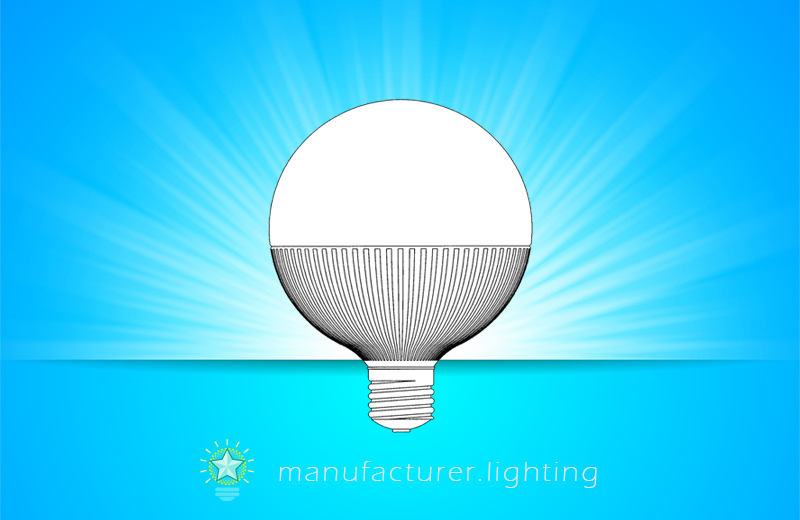 An LED bulb may be constructed with a form factor that facilitates it to replace a standard incandescent bulb, or any of various types of fluorescent lamps. It is noteworthy that AC current is commonly utilized to drive both incandescent and florescent lights which are seen in homes and commercial buildings. Because of the worldwide popularity of these lights, most buildings are built to have 120 or 240 volt AC current delivered to the building or structure by an electric utility. LEDs, which are current-sinking devices, typically need a constant-current, direct-current power supply for efficient and stable operation. And as a result, incorporating LEDs into residential and commercial lighting systems demands that the LED be connected to a "driver" circuit that converts alternating current into a suitable direct current for the LED. An LED bulb designed as a substitute for a traditional incandescent or fluorescent light source is required to be self-contained; a power supply is included in the lamp structure as well as the LEDs or LED packages and the optical components. A heatsink is also often necessary to cool the LEDs and/or power supply with the intention to maintain appropriate operating temperature. LED bulbs can be purchased in different forms and shapes. The A-line or A-shape bulbs are the most commonly seen lamps in the market designed mainly for household lighting. The most commonly used A-series light bulb type is the A19 bulb (or its metric equivalent, the A60 bulb) which has a one-inch long (type E26/E27, i.e. 26/27 millimeters in diameter) Edison screw base. The GU10, MR16, PAR38 bulbs are the typical flood, spot, or PAR type LED bulbs widely used for downlighting, track lighting, or accent lighting in shops, offices and the home. LED bulbs are also used in outdoor and industrial lighting. LED corn bulbs, for instance, are frequently used in pathway/high bay/low bay lighting fixtures. These lights typically use SMD (surface mount device) or COB (chips on board) LED chips are light sources.